With 600 Tulkus, Geshes, Masters and monks keeping the lineage alive, Shar Gaden is located in Mundgod South India. It is next to Gaden Monastery and 25 minutes away from Drepung. We can access this great institute via Bombay or Bangalore. From Bombay/Bangalore you may take train or Bus which is 8-10 hours to the nearest city of Hubli. From Hubli it is one hour away by taxi. Since His Holiness the Dalai Lama has said that all Dorje Shugden practitioners must separate from the Monasteries and the general populace of non-Dorje Shugden practitioners in all ways, this monastery was formed. All Tibetans who do not practice Dorje Shugden may not have any association with those that do was the strict decree. As a result many tulkus, geshes, senior practitioners and monks had no choice but to sadly leave their respective monasteries out of respect for His Holiness Dalai Lama’s decree. They gathered and joined to have Shar Gaden Monastery. Shar Gaden Monastery was not formed to counter or oppose His Holiness the Dalai Lama in anyway, but to have the freedom to practice as they have been from the instructions of their root gurus. H.H. Kyabje Trijang Choktrul Rinpoche’s ladrang has also joined Shar Gaden leaving Gaden Shartse Monastery, where his line of incarnations have been for hundreds of years. Domo Geshe Rinpoche also has joined. This video shows Shar Gaden Monastery today alive with practice, debates, pujas, torgyas, and teachings. They have been ostracized by the whole Tibetan community who are not allowed to have ANY ASSOCIATION WITH THEM. We need to give them our support now to keep the lineage alive for future generations. Share this video with others. Shar Gaden’s existence is hope, strength, light and practice exemplified. Its continuation offers us great encouragement. Obviously Shar Gaden Sanghas are experts in doing many types of beneficial pujas such as Tara, Medicine Buddha, Dorje Shugden’s various rituals, pujas, fire offerings, mandalas, Heart Sutra, Pelden Lhamo, Namse, Kalarupa, Mahakalas, etc. Wonderful to sponsor a puja for birthday, anniversary, death, marriage, special events, or just to clear obstacles for whatever plans you may have. Do contact, support, visit and do whatever you can for our Sangha who wishes to practice their lineage as it has been done for 350 years now. It is the least we can do to help safeguard this holy lineage which is going through obstacles at this time but will shine forth bright in the future as predicted. These are recent photos of Shar Gaden Monastery, Mundgod, South India, which separated from Gaden Monastery because the monks held strong to their commitments towards their Gurus and refused to give up the practice of Dorje Shugden. 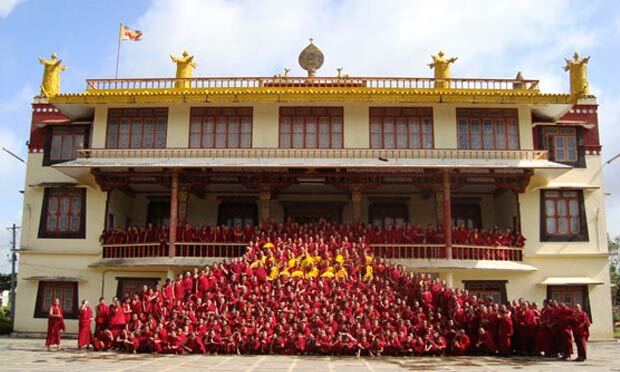 Today it is a flourishing monastery of around 550 monks, and increasing. with gratitude and humility I thank you all the concerned Lamas for keeping the lineage alive in spite of huge difficulties. Thunkje che, Tashi delek. This is from white house. You guys rocks too much, So I have to send my US troops!!!!!!!!!!!!!! A monastery born out of necessity but is growing and thriving. May all who walk through it’s doors be blessed and is brought closer to the pure and stainless teachings of Lama Tsongkhapa. May Shar Gaden Monastery continue to flourish and bring dharma to benefit many.